Today as Mercury moves into an opposition with Chiron, you may be thinking about the synchronistic events in your life and how all of your actions impact on one another and echo endlessly out into the Universe. The Judgment card speaks of atonement, forgiveness and unconditional love. These are all qualities you’ll want to keep in mind today, especially if the need to act on any of them resonates with you personally. 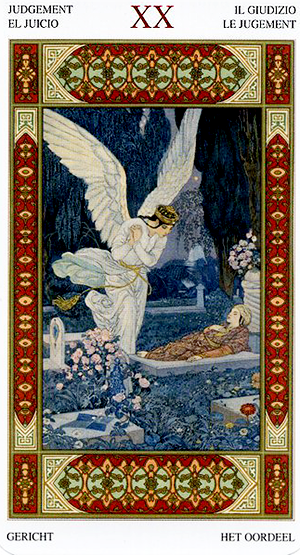 This version of the card depicts a scene from Sheherazade’s Arabian Nights, in which a young Jinnī spirit appears in a cemetery to aid the fallen heroine Hassan Badreddine. While not all Jinn creatures are angelic — in fact they are notoriously malicious — they all possess supernatural powers and are thus able to change the course of life and death. In this tale the young Jinnī’s compassionate service doubles as an act of retribution elsewhere. Even in this context, the Judgement card has karmic implications. On one hand the Jinnī assists a mortal whose demise was unfair and untimely, thus creating positive karma. And on the other she defies the gods — thus creating negative. The Judgment card tells us that what goes around comes around — even if not directly, and even if not in this lifetime. It refers to an epiphany or awakening, during which you realize the consequences of your actions and are therefore more inclined to proceed conscientiously. While you may be reaping karma and sewing it at the same time — like the young Jinnī in this card — it’s also important to recognize how the effects of your actions reverberate endlessly and may not be realized for some time. This is also in line with the Mercury / Neptune opposition which can cloud your thinking and impair your judgment. The Judgment card serves as a reminder that we’re all only human and all worthy of redemption. If we can incorporate the concepts of forgiveness, absolution, repentance and unconditional love into our lives, everything else will fall into place. The card used for today’s tarotscope — Judgement — is from the beautiful Tarot of the Thousand and One Nights, featuring paintings by Léon Carré, a Lo Scarabeo deck published by Llewellyn. The Tarot of the Thousand and One Nights is inspired by the Arabian folktales reputed to be the work of Scheherazade. Léon Carré was a French Orientalist painter born in the 19th century who was noted for his stunning murals, illustrated books and elaborate paintings.